So long to the days of drinking sugar bombs and face-puckering beverages to help aid digestion. 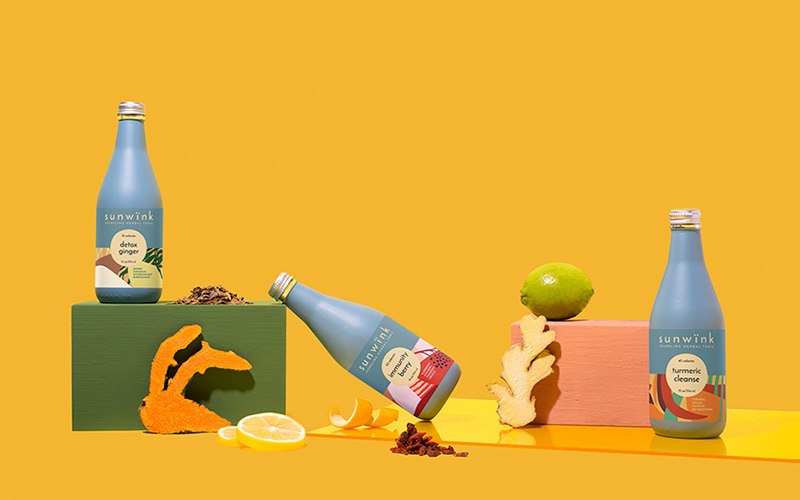 Welcome Sunwink- a San Francisco based, female founded herbal tonic beverage that is bringing herbs to the forefront of the self-care scene. And rightly so, consumers are saying Sunwink’s Detox Ginger herbal tonic makes their stomach feel better than any kombucha they’ve ever had. Since its 2018 launch- the brand’s Sparkling Detox Ginger has quickly become so popular its had to rapidly increase production. Using bitter herbs like dandelion and burdock root to help the body release digestive enzymes, the effervescent tonic helps the body do what it’s supposed to do, as opposed to kombucha, which merely adds probiotics to the system (a good, but temporary fix). With half the sugar of a kombucha (most kombuchas range from 12 – 24 grams of sugar per bottle) and 35-50 calories per bottle, Sunwink uses the cleanest and simplest ingredients – NO NATURAL FLAVORS and NO CITRIC ACID. The herbal tonic’s flavors come from the herbs. The drinks are paleo and vegan friendly; they use organic maple syrup to slightly sweeten the blends. “Sunwink puts thought and care into their blends, taking the time necessary to think about which plants they use and what they want to achieve with them,” says Clinical Herbalist, Anne Beauchemin. Retailing for $ 5 a bottle – the beverage is also available in Turmeric Cleanse and Immunity Berry and can be found at drinksunwink.com. With the rapid decline of soda, sparkling and functional beverages are on the rise. Enter Sunwink – the only sparkling herbal tonic beverage on the market. Herbal tonics are a new kind of healthy drink – they taste like a sparkling juice, but all of the flavor comes from herbs. Each Sunwink contains at least 1,000mg of herbal extracts – that’s 4 – 8 times what you’d typically find in an herbal tea bag. And the best part – each Sunwink is inspired by a real woman and the herbs she uses. Sunwink gives 1 % of net sales to organizations of the women’s choosing.